Below is an exciting book review by William Kowinski, (author of “”The Malling of America””), from a 2002 Sunday Chronicle. The book, “Children and Nature: Psychological, Sociocultural and Evolutionary Investigations”, is an anthology of essays edited by Peter H. Kahn Jr. and Stephen R. Kellert. child plantingIn his 1982 book, “”Nature and Madness,”” human ecologist Paul Shepard made an astonishingly sweeping and convincing case for the proposition that from early childhood through adolescence, interaction with the natural world is crucial to human mental and emotional development, and without it, humans are growing up immature, unbalanced and demented, as well as absurd. In the essays anthologized in Children and Nature, psychologists as well as cognitive scientists, educators and political scientists follow up on the pioneering work of Shepard, Rachel Carson and Edith Cobb with more systematic examinations of childhood experiences of nature in today’s world. They aren’t missing the connection anymore. In an era of disappearing nature, their findings are disturbing. The complexities of plant and animal life and their multiple roles in our lives are crucial in learning to classify and compare in early childhood – differentiating models of the neighborhood’s SUVs just isn’t the same thing. Watching animals on TV is perhaps better than nothing, but there is no substitute for real-world experience in a child’s conceptual and emotional exploration of what life is and what it means. 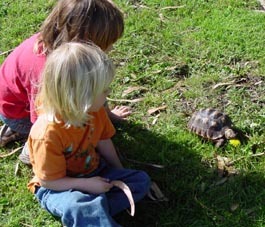 Caring for creatures or plants is often the child’s first experience in the feelings and practicalities of caring for another, as well as in responsibility. Animals provide lessons in distinguishing the self from others, and in their dealings with the “other” – the similarities and differences – children learn empathy as well as a healthy regard for dangers. These and other experiences help form conceptual and moral thinking of an appropriate complexity (for example, an animal can be both lovable and dangerous), and a grounded sense of reality.Such experiences arc increasingly rare. Even the living lessons called common sense embodied in language expressions that use animal and natural metaphors are disappearing or have lost their experiential references. Fortunately, some authors here find hope in programs that involve children, and especially adolescents, in the natural world, from outings to engaging high school students in protecting a wildlife sanctuary. They encourage parents to actively integrate experiences with nature in their children’s lives at every stage. Eventually teenagers and children respond viscerally to wildlife experiences; the call of the wild to the wildness within is still strong. We are, as Shepard often pointed out, genetically the same beings formed by close interaction with nature for millions of years, and share most of our genes with fellow animals. Books like this, edited by two distinguished scientists, help us understand how we can and must find ways to honor these affiliations and deep human needs in our own societies today.